I had such a great time participating in our classroom mock election! Thank you to the 6th graders for being good poll workers and keeping everything organized. We will learn the results of our election on November 6th, Election Day! This beautiful October week will bring many opportunities for fun and learning in the classroom! Social studies lessons will focus upon the Bill of Rights, writing an essay on the causes of WWII, and using our country study charts to research Latin America. Our novel studies will continue with a focus on summarizing. Please be sure to complete your lesson follow-up work in a timely manner. As always, you will have your weekly NewsELA current event and quill.org activities to complete. It finally feels like Fall is in the air! I hope the refreshing weather renews your energy and spirit! CAMPAIGN – Course of action designed to influence voters in an election Your lessons will include meeting with your novel study groups to make predictions about what may happen in your texts. Be sure to complete your weekly NewsELA comprehension activity and your assigned quill.org task. Everyone will have a word study quiz Friday on the following words. These words should be copied onto your workplan Monday. 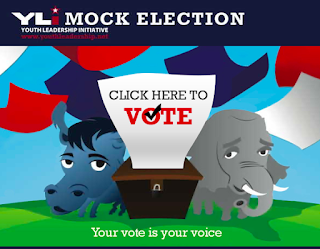 I'm excited to announce that our classroom will be participating in the Youth Leadership Initiative Mock Election! During the week of October 22, students will be able to cast their vote in a mock mid-term election in our classroom voting booth! The ballot will include voting for the future Governor of Georgia and the Georgia House District 1 Representative. The results of our classroom election will be compiled with those of other schools around the country. It will be exciting to see how our results compare with the outcome of the actual election! Weekly progress reports for all students have been sent home today. Please review, sign, and return them to your homeroom teacher tomorrow. 6th grade students: Your first report card has been given to you today! Please review it with your family. You do NOT need to sign and return it. The PTA Health and Wellness Committee is excited to once again kick off its annual greenery sale! This fundraiser offers beautiful greenery at affordable prices and is used to raise money for our school gardens. Order online using THIS LINK or use the paperwork that came home with your child. Local delivery items will be available for pickup at Ellis during the week of November 26. Direct delivery items can be shipped anywhere! The deadline for order is November 1. Thank you for your support! This beautiful October week will bring many opportunities for fun and learning in the classroom! Social studies lessons will focus upon the structure of the United States Federal government, the causes of WWII, and Latin America country profiles. Our novel studies will continue with a focus on making personal connections to the text you are reading. Please be sure to complete your lesson follow-up work in a timely manner. As always, you will have your weekly NewsELA current event and quill.org activities to complete. -Monday is the rescheduled fall picture day. Feel free to dress up! -Friday is the PTA Fall Festival! Please join in the autumn fun in the school yard! -Mr. Trent's homeroom conferences continue this week. Please contact me ASAP if you need to reschedule for any reason.